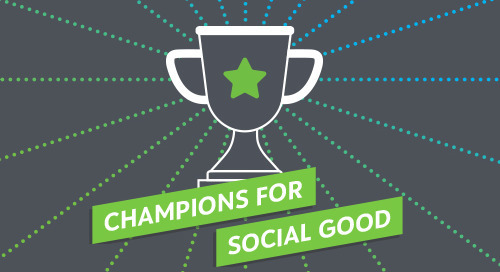 In this episode of the Champions for Social Good podcast, Rachel Hutchisson (@RachelHutchssn), vice president of Corporate Citizenship and Philanthropy at Blackbaud (@blackbaud), speaks with Justin Bakule (@jbakule), executive director at the Shared Value Initiative (@SVInitiative), about the concept of shared value and how SVI is helping advance the practice of shared value through best practice sharing, capacity building, research, and its annual Shared Value Leadership Summit. Justin explains what shared value is at its core, and how it can help companies gain greater insights into their customers that lead to long-term value creation. Concrete examples of companies practicing shared value are highlighted throughout the episode to help listeners understand the various ways shared value can be incorporated into a company’s core business model. Rachel and Justin also talk about how shared value and corporate social responsibility (CSR) can complement each other both directly and indirectly. Finally, Justin shares how the Shared Value Initiative is building an enterprise diagnostic tool that will allow companies to track their progress in incorporating shared value into their business practices and help them compare their progress against their plans. After listening to the episode, read Justin’s article in our new eBook “CSR 2020: Experts Look Ahead” to learn about the future of shared value.